San Francisco: A recent test drive of Ford's 1999 Mustang GT Coupe resulted in a week of great motoring, which is the nucleus of the Mustang dogma. For the young or the young at heart, Mustang is still the Number One Pony Car ever built, fun to drive and affordable to own. It was the first "pony" to make the scene back in 1964 as an all-original Ford idea. Our test Mustang arrived in bright red metallic with polished aluminum wheels and tan interior. A premium sound system, with CD player and cassette, is now standard in both flip top and coupe models. Other standard items include air conditioning, power windows, power door locks, power decklid release and remote keyless entry. Our GT received motivation from a well-built and upgraded 4.6-liter SOHC V-8, which now puts out a throaty 260 horsepower, up from last year's 225. This 35-horsepower increase is a pleasant addition, erasing the sole performance complaint we had when comparing a '98 GT to the General Motors twins of Camaro and Firebird. The 260-horse engine is a far cry though, from the 32-valve Double Over Head Cam (DOHC) SVT Cobra's engine, which we'll test later this year (by 60 horsepower and $6,000 more). However, we'll also admit GT is by no means a slouch, and could possibly be a better buy than the Cobra if one's budget plays a major role. Unlike the Mustang GT's solid rear axle, the Cobra features an independent rear suspension "live axle" setup, something we'd like to see the GT adapt in the future. Leave the solid rear axle for the 6-cylinder version, and give the GT the added "Cobra" handling accent it deserves. The GT is also capable of giving great gas mileage too, with 27 highway and 17 city, by the numbers. 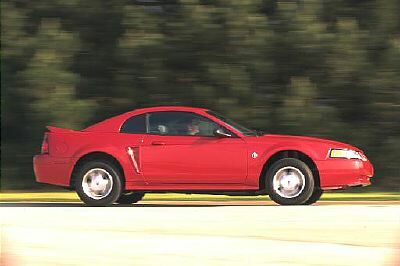 In the looks department, the '99 Mustang is tweaked a bit over last year, and more pleasing to the eye. The design has an uncanny ability to appeal to both young and middle-aged drivers, as many baby boomers enjoy driving Mustang GTs. Now, back to the car itself. We drove the Mustang on daily 60-mile commutes, highlighted by twisting, country roads and some nice, long straight-aways. The central California backdrop makes this experience both aesthetically pleasing while allowing a more than capable test drive exercise. Our morning runs through the country hills and valleys made Mustang's comfort and handling ability a standout, especially when compared to the GM competition. Thus, Mustang receives a one-up for those who insist on more comfort in their Pony Car choice. The power resulting from the five-speed motivated, 3.27:1 rear axle equipped GT makes merging and passing easy, with brisk acceleration awaiting consumers. As we've said before, a powerful car in the right hands is a safer car, overall. This Mustang will accelerate to 60-mph in 5.5 seconds, and run the quarter mile in 14.2 at about 100. That's very fast, considering the Cobra, at $6K more, will run to 60 in 5.3 seconds and turn the quarter mile in 13.8 at 103. To some, it's worth $6 grand more, to others it's not. The sticker price of our GT came in at $22,000 - a price we feel is very attractive for this type of V8 sportster. (The 3.8-liter 6-cylinder versions go much cheaper). On the resale market, Mustang is average to slightly above average in resale value, with an active secondary market of younger buyers awaiting the day you might trade in your GT. Competition comes from the aforementioned Chevy Camaro and Pontiac Firebird, both capable foes and both on the endangered species list over at GM. This is a puzzling situation in our minds, wondering why a manufacturer like General Motors would even think of dropping some of the most exciting cars they build, and build so well. Still, in many areas, albeit very close in comparison, we feel the Mustang is the better buy, especially in the comfort and upgraded power area. Mustang also offers a better base price value, and suffers only in the all-out performance department, where the Trans-Am and Z-28's with the new SB2 Chevy/GM V-8 out powers Mustang GT handily (5.2 to 60 mph and 13.4 in the quarter at 106). However, if the Cobra SVT option is ordered, then it's a much closer comparison all around.